Bruun Rasmussen will hold their next international auction including antique rugs 4 December 2017 at their premises in Bredgade 33, Copenhagen. ‘Our sale includes a wide variety of collector rugs and good quality rugs. Among the items you will find three complete Turkoman tentbands, a fine Khasgai Shekarlu, several silk rugs, some important Chinese rugs from the forbidden city in Beijing and the highlight of the sale, two outstanding silk Heriz carpets‘ says Bruun Rasmussens carpet expert Henrik Schleppegrell to Jozan Magazine. 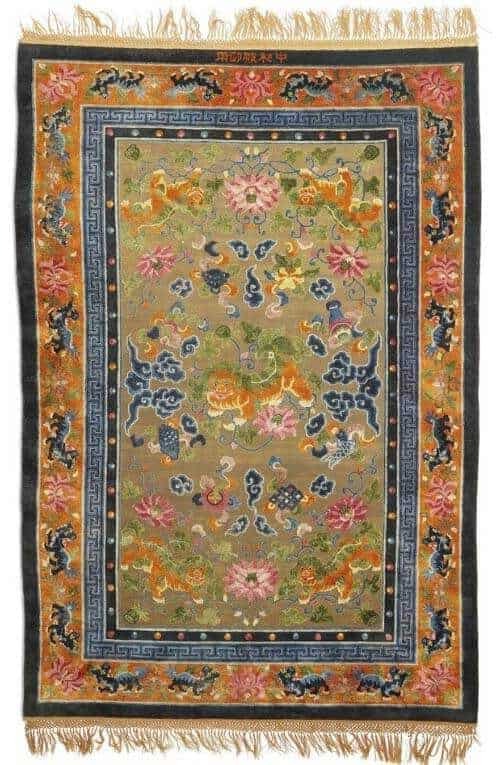 An antique Imperial Chinese palace silk rug. Signed: The Palace of Middle Harmony. Est. 33.500.- Euro. Location and more information: Bruun Rasmussen Auctioneers, Bredgade 33, DK-1260 København K.